Whenever a game is being described by its fans or creator as “art”, it’s a white flag that there’s going to be trouble and controversy ahead. For as much as has been made about the ‘are video games art?’ question in the past, the fact remains that most people – even most gamers – don’t deploy the A-word about a title unless someone’s offended about the content or at the very least irritated by the execution. The moment I saw the fine folks at Kotaku referring to Proteus as “the lastest art piece”, I had a feeling that this wouldn’t be the easiest game to review – and quite possibly a chore to play. So the important question to ask is: is this one of those “art” games that actually manages to be worth its asking price (in this case, $9.99 at the Steam store)? Or is this just a case of someone phoning in a lazy game with some modest content to speak of and hoping no one sees through the whole “the beauty is in its simplicity” routine? 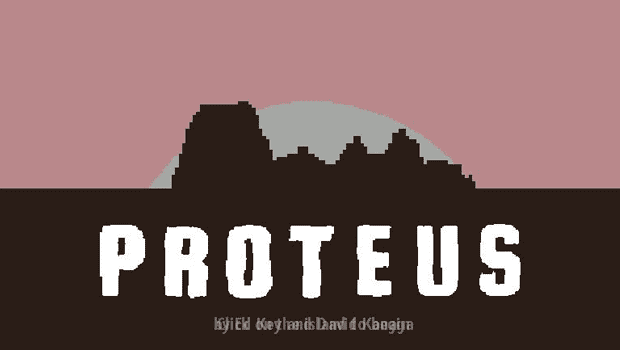 First, let’s deal with the all too obvious: Proteus is a very simplistic game in terms of both graphics and sound. And when I say simple, I mean we’re talking about graphical simplicity on the order of the original Atari 2600 Pitfall! game. The sounds are barely that much better, being a mix of barely tonal musical hums and various pitches of blips, boops and other simple onomatopoeia. I don’t say this to bash Proteus, because frankly, I can endure some incredibly simplistic graphics in a game – right on down to relatively bare text and ASCII imitations of tilesets – so long as I can understand what’s going on, and the game’s mechanics follow through with the fun and performance. It’s a niche position to be in nowadays when beautiful graphics are practically becoming a standard for even free-to-play indie games, but it’s the perspective I come from. I also know it’s not a perspective everyone shares, so take this as a warning – if you can’t endure extremely blocky, simple (if smoothly animated) graphics, skip Proteus straightaway. You’ll be clawing at your eyes from the intro screen alone. [singlepic id=10689 w=320 h=240 float=left]With the graphical warning out of the way, let’s talk about the heart and soul of Proteus: exploration. Normally, exploration is a kind of bonus to a game – in the Grand Theft Auto or The Elder Scrolls series, exploration means running around in a largely open world, seeking hidden areas and sights and dungeons in the course of your adventure. In Proteus, there is no “course of your adventure”, because as near as I can tell, you are simply not on one. Who you are, where you’re from, or just what you’re seeing in Proteus isn’t explained at the start, as as near as I can tell in my time playing, doesn’t become explained at any point in the future. In fact, there’s not even a save function to speak of – each game generates a new landmass for you to explore, so to a degree your exploration experience is fresh each time. Which is important, given that – again – walking around, looking at things, and observing the reactions of the Proteus world to your presence is all there really is to the game. That’s not to say Proteus isn’t a bad game, or not worth experiencing at all – it simply is stingy with the moments of exploration that would justify itself. The graphics and sound, while simple, is still somewhat endearing. The fact that it generates a new island each time you load it up is a decent touch. The ability to share particular islands with friends via a screenshot “postcard” is inventive – even if I have trouble imagining most people taking advantage of it. If it were cheaper, if there were more to it, it would justify its $9.99 asking price. As it stands now, however, most people would probably be better off holding onto their money and looking elsewhere to satisfy their exploration fix.